Astronomers have spotted higher-than-expected numbers of the strange celestial objects known as brown dwarfs hanging out in the cluster NGC 1333, a gas and dust cloud that harbors young stars. The results suggest that there may be something particular about the environment in NGC 1333 that causes bountiful brown dwarf formation. Brown dwarfs are mid-range objects, too large to be considered a planet but not quite large enough to burn hydrogen and become a star. Most have a mass between approximately 20 and 80 times the mass of Jupiter and, when young, they glow brightly in infrared wavelength due to the heat of their formation. Using the Subaru Telescope in Hawaii and the Very Large Telescope in Chile, both of which observe the infrared, researchers spotted 30 to 40 new brown dwarfs in NGC 1333. The researchers estimate that for every two stars in the cluster, there is one brown dwarf — significantly more than in other star-forming regions. 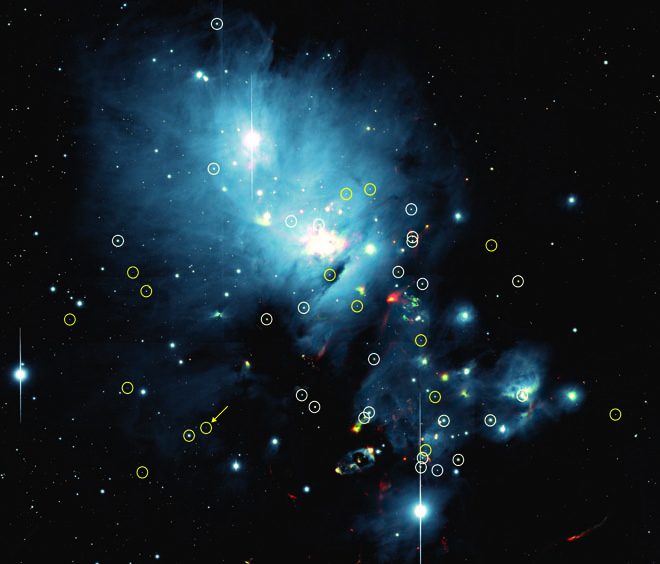 The findings appear Oct. 11 in the Astrophysical Journal. Though the team was unable to say why NGC 1333 had particularly plentiful brown dwarf formation, the region offers a rich trove of data. Many of the observed brown dwarfs were on the low end of the mass range, less than 20 times Jupiter’s mass. The smallest has only six times the mass of Jupiter, putting it among the smallest free-floating objects ever observed. These results can help astronomers understand more details about brown dwarf and star formation, specifically how their early evolution depends on their mass.